Gamma Knife® radiosurgery is one of the most advanced and non-invasive options for brain-related conditions like, malignant and benign brain tumors, arteriovenous malformation, tremors due to essential tremor or Parkinson's disease and trigeminal neuralgia. 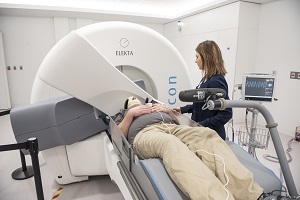 Since it is an outpatient procedure, Gamma Knife patients are able to return home the same day, with a reduced recovery time versus that of conventional brain surgery. To schedule a visit with a Cleveland Clinic brain tumor specialist, please call 216.636.5860.